FANTASTIC, inspired filmmaking. (I gotta look for more Todd Haynes.) Maybe I was super-well prepared for it by this late date, but as it was, I could easily follow it, and it painted a brilliant million-dollar-picture. Obviously the unsuspecting could be caught off guard by the allegory and non-linear storyline, and I can see how it might come across as not entertaining for non Dylan fans — but for those familiar with this major artist’s life and work, it’s full of humor and impeccable detail in scene recreations (which are then played with), all mixed in with archival footage of Greenwich Village and such — especially the dustbowl Hattie Carroll, and all the Don’t Look Back reenactments! 🙂 . . . the press conference, the hotel rooms, the encounter with the Duchess, and the overly analytical fan! I just LOVED the script! How it skipped around in time, but still flowingly told a chronological story. It was like a merge between Bob’s books Tarantula and Chronicles — poetically licensed autobiography (see, also: Kerouac, Jack). It was a lot like Masked & Anonymous — both very surreal musical dramedies starring Another Side of Bob Dylan — both with similar wonderful soundtracks of original Bob mixed with other’s versions — and both featuring a calliope of strange characters, and with a black child singing and stealing the show. And B), it’s a helluva lot like Renaldo & Clara in many of the same ways. Life is a crazy, dark circus. This is the kind of movie, like a great CD, that you could just put on at a party and let it play in the background — a series of music & words with images, called “scenes” instead of “songs” — you can dip in and out anytime, for as long as you want, then go back to your conversation. 🙂 With all the Bob-inspired dialog and songs woven together it’s like a Dylan musical for two hours. Or that sweet Hitchcockian overhead B&W slo zoom-in of Dylan writing Tarantula with all the pictures surrounding him on the floor. Or the scene in the car after the great, “That was Allen Ginsberg, man!” –> into the battle between Bob and the reporter –> into that epic Ballad of a Thin Man!! Sick! And the whole thing interspersed with a Spinal Tap mockumentary riff! 🙂 woven into Don’t Look Back and a nature documentary about a grizzled Grizzly Adams Gere living in the woods! Great poetic storytelling. It was realistically surreal. Like Terry Gilliam can capture it, or van Gogh, or Lewis Carroll, or Alvin Ailey. It’s crazy, it’s distorted, but it’s real. All around, a playful joyous complex poetic work of art befitting its subject. And that it was mostly shot in Montreal! Beauty, eh! Bake the brownies in advance. Here’s more Bob — when he played the Kool small venue show in Toronto. Or here’s where he came out and joined Bruce at Shea Stadium. Or here’s a review of another funny-cool twisted movie — My Dinner With Jimi. Or here’s from the London premiere of On The Road in the courtyard of Somerset House. And here was the world premiere of the new shorter version of On The Road at the Toronto Film Festival. Or here’s some other funny off-Beat movies about the Merry Pranksters and The Beats. Or here’s an overview of all the Beat movie dramatizations ever filmed. Or here’s a review of the lost footage of the historic roc n roll train trip that was finally released as Festival Express, starring the Grateful Dead, The Band and Janis Joplin. Or here’s the Scorsese’s Rolling Stones concert film — Shine A Light. Or here’s a fairly unknown but perfectly offbeat comedy — Lucky Numbers — with a comedic Travolta, Lisa Kudrow, Tim Roth, Michael Rapaport, Richard Schiff, Michael Moore and many others. Or here’s a bunch of films I reviewed on IMDB. Or here’s a master list of Brian’s Hot 200 movies including all sorts of cinematic riffs and tips. Beats the hell out of “Renaldo & Clara”! Great review of a great film. Thanks. Cate Blanchett is the modern master. 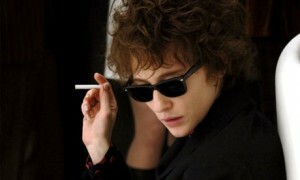 That she can *be* Bob Dylan … AND Katherine Hepburn … !!!??? I really enjoyed this review very much. It made me want to see the movie yet again, really refreshed my love for it. Thank you for going to the trouble to compose and post. There was a talk on “I’m Not There” at the conference I was at last week, but I missed the talk. I always say I would love to hear this film discussed as great American fictional biography, and not as a movie about Bob Dylan. You don’t need to know a thing about Bob Dylan to be engrossed by the way Haynes creates a collage using the themes of creativity, fame, authenticity, betrayal, public/private identities –American ideologies of individualism and populism make these themes exhausting battlegrounds for artists, and Dylan is the ne plus ultra here, and his life is only the palette for the movie, not its topic. The songs are used so effectively that you simply have to pay close attention to hear how they color a scene. You don’t have to know anything about Cold Irons Bound to feel that chill when strung out Cate Blanchett is in the bathroom drawing that mustache on herself (is there enough gender bending here for 14 doctoral dissertations??) and you hear that line “I’m beginning to hear voices.” Just pay attention. You can hear the wonderful incongruity of the surreal lyrics of Tombstone Blues in the little scene with Marcus Franklin and Richie Havens, just a bunch of black bluesmen singing, “Ma Rainey and Beethoven unwrapped a bedroll.” Just pay attention and you’ll get it. It really is, to me, a movie that is similar to Dylan’s work only in that it repays close attention for anyone who is paying close attention. It fell off the screen so fast not because people weren’t getting the film’s Dylan code, but because it doesn’t offer itself up simply. Every songwriter should have this movie made about them. I want to see the Neil Young and Tom Waits versions. Bob in books … Bob in movies … Bob in concert … it’s Bob’s world — we only live in it. Thanks for playing it out in poetry. You caught it, you crazy Prankster. The magic is in the play. It doesn’t matter what you write about — I love it! Knowing your knowing the Beats, I’m so happy to see, and … of course! you’re a Dylan fan, too. Jefferson, Whitman, Kerouac, Dylan … it’s a wide range of Romantic America we — and you — celebrate. Grazie. Bob makes for fine cinema.